Use Nmap, Nessus and Metasploit to protect your servers. 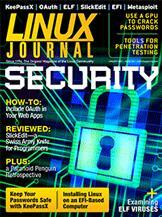 Although the success of existing Linux viruses has been limited, the threat still remains. How to use KeePassX to make password management easier. Continuing the EFI story with a description of the steps you need to take before installing Linux on an EFI-based computer. Doc Searls' EOF Is There a “Personal Data Economy” If You Control Your Own Data?